Premier of Queensland Annastacia Palaszczuk broke ground on Brisbane’s $158 million new International Cruise Terminal. The project is planned to open in October next year, with the potential to more than double Brisbane’s cruise industry. The economic boost in accommodating more tourists and supplying bigger ships is estimated at over a billion dollars over the next few years, on top of Queensland’s already billion dollar industry. 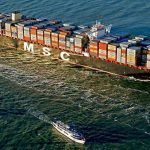 Today, MSC Australia provides its customers with direct connections to all major overseas markets. Here’s a sneak peek of its story made of growth and opportunities, with more to come. As Reuters reports, prices for Australian heavy-sweet crude grades are increasing since traders rush to gain cargoes for blending ahead of new rules on shipping fuel, placing them among the most expensive crudes in the world. Specifically, the high premiums are beneficial for the producers as BHP Group , Santos Ltd and Inpex Corp, which sell grades such as Pyrenees and Van Gogh produced offshore western Australia. EPIK has agreed a design, engineering and construction services deal for Newcastle LNG FSRU import terminal. The Australian National Offshore Petroleum Safety and Environmental Management Authority informed that oil and gas major Shell has applied to obtain a permission to conduct a seismic survey offshore Kimberley, Australia. Namely, Shell Australia is planning to carry out the Factory three-dimensional (3D) marine seismic survey (MSS) within the Browse and Bonaparte Basin offshore Western Australia (WA).